Joe and Joan Eckert were running a vegetarian lunch counter at the local YMCA where Julian Price, owner of Public Interest Projects, was a regular customer. Many meals and conversations later, Julian introduced the Eckerts to Pat Whalen, the President of Public Interest Projects, to work out the financing for a vegetarian restaurant in downtown Asheville, preferably within easy walking distance from Julian’s apartment. Public Interest would provide cash, and management and accounting assistance; the Eckerts would bring creative cuisine, a commitment to quality and a wonderful aesthetic sense. 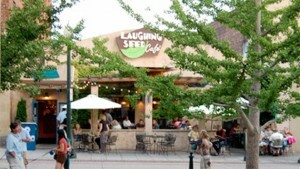 The result was the Laughing Seed Café. Voted one of the best vegetarian restaurants in the country, this local favorite features foods from around the world made with all natural and predominantly organic ingredients.